Unfortunately for utilities, new technology and commercial opportunities in the coming years will only increase the threat to the 1.0 business model. This is the third of four parts of ILSR’s Beyond Utility 2.0 to Energy Democracy report being published in serial. Click to see the first or second or third post. Download the entire report and see our other resources here. Electric vehicles, becoming popular because of much lower mileage costs than gasoline, will become another potential tool for individuals and microgrid operators to manage their electricity use. We also illustrate how utility 2.0 could come up short of the potential for an economic transformation of the energy system, and how Energy Democracy (or utility 3.0, if you prefer) adds a few crucial principles that enable the continued rise of customer-owned power generation and control of their energy future. Notably, these principles do not align with current financial incentives for most investor-owned utilities (or the typical business practices of most utilities; private, public, or cooperative). Furthermore, the principles are indifferent to the economic opportunity. That is, they can be implemented with utility control of the grid and its benefits or with a massively decentralized and democratized electricity economy. Planning that integrates local and regional level resources. In other words, ensuring that when planning for new power plants or power lines, utilities (or grid managers) consider how needs can be met with local solutions including rooftop solar, energy storage, electric vehicles, and even non-capital measures like controllable, smart appliances. Independent, neutral operation of the distribution system. In other words, removing the conflict of interest that causes incumbent utilities to prefer building new infrastructure to conservation, efficiency, or local power from competitors or even utility customers. Underneath these structural changes are the core policies of a utility 2.0 framework: separating utility financial health from energy sales (a concept typically called decoupling) and separating utility profits (for investor-owned utilities) from building and owning infrastructure. The other substantial policy change is shifting from shareholder returns based on infrastructure investments to performance-based returns; returns based on a flexible, low-carbon, efficient electricity system. Some states, like New York, have layered financial penalties for non- attainment on top of the existing return on equity formula. In other words, for-profit utilities can lose money when they fail to accomplish objectives related to clean energy. But as of yet, no U.S. state has transitioned to a business model that rewards utilities solely for their ability to meet utility 2.0 benchmarks. Should Incumbent Utilities be the New distribution System Operator? When Pope Julius II wanted the Sistine Chapel’s ceiling painted, he didn’t hire the house painter. He went for the best. Somewhere out there is a Michelangelo of distribution system design and opera9on. It might be the local utility. We won’t know unless we look. A few states have begun moves toward a new utility business model and their experiences are instructive. We include one international example, since it’s illustrative of the open distribution marketplace that many Utility 2.0 advocates desire. The regulators of New York’s electricity system have already made many moves toward Utility 2.0 and have learned several lessons.74 Commission efforts include basic Utility 2.0 strategies like revenue decoupling and performance-based rates (with penalties for poor performance), as well as incentives for energy efficiency and distributed renewable energy, demand response, simplified interconnection, robust net metering, and a Green Bank to finance advanced energy projects. Some lessons from these reforms indicate that the transition to Utility 2.0 isn’t without its challenges. For one, it’s been hard to determine, in advance, if utilities are spending enough money on grid maintenance, with utilities and regulators having to come back for supplementary rate cases when estimates have been inaccurate. Additionally, the performance-based incentives need to be improved with more frequent re-evaluation, higher penalties that are sufficient to win compliance, and some allowances to encourage learning through trial and error. Prior to the crush of customer solar, the state had already implemented decoupling to insulate the utilities’ bottom line from the loss of sales. However, the utilities planned poorly for the surge in distributed renewable energy installations and responded with caps on customer- owned power generation. The Commission orders are already making a difference. In October 2014, Hawaiian Electric, Maui Electric and Hawaii Electric Light released a revised integrated resource plan to achieve 65% renewable energy by 2030; and for the island of Hawaii specifically, 92% renewable energy by 2030.83 The plan also allows for a tripling of rooftop solar installations. These improvements are not final, as the dockets and Commission orders are still open for review. 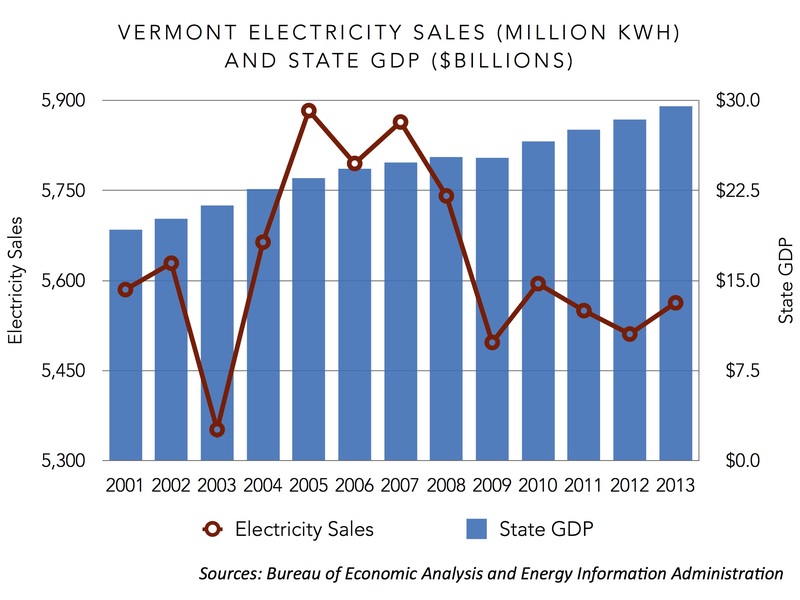 Vermont: Utility 2.0 in Action? Vermont’s regulatory environment most closely approximates many utility 2.0 principles, with the exception of largely retaining utility control over the distribution system. Although the state has shifted toward this new utility model over 15 years, recent policy moves were triggered by the anticipated 2014 closure of the Vermont Yankee nuclear power plant that has supplied 35% of the state’s electricity. In 2009, the Vermont legislature adopted a standard offer or “feed-in tariff” program to encourage small-scale renewable energy generation. The program provides 15-to-25-year contracts for power generation from biomass, wind, hydro, landfill and agricultural methane, and solar energy. The program originally had fixed and published prices, with a total program size of 50 megawatts (MW), and projects limited to 2.2 MW or smaller. Adopted in 1997, Vermont’s net metering law allows individuals or groups of utility customers to offset their energy use with a 500 kilowatt or smaller renewable energy system. Solar producers receive an “adder” to their net metering credit, sufficient to award them 20¢ per kilowatt-hour. Not all Vermont utilities support net metering, because of differences in their electricity demand. While Green Mountain Power has its peak energy demand in the summer (when solar production also peaks), other Vermont utilities have their peak demand in the winter. 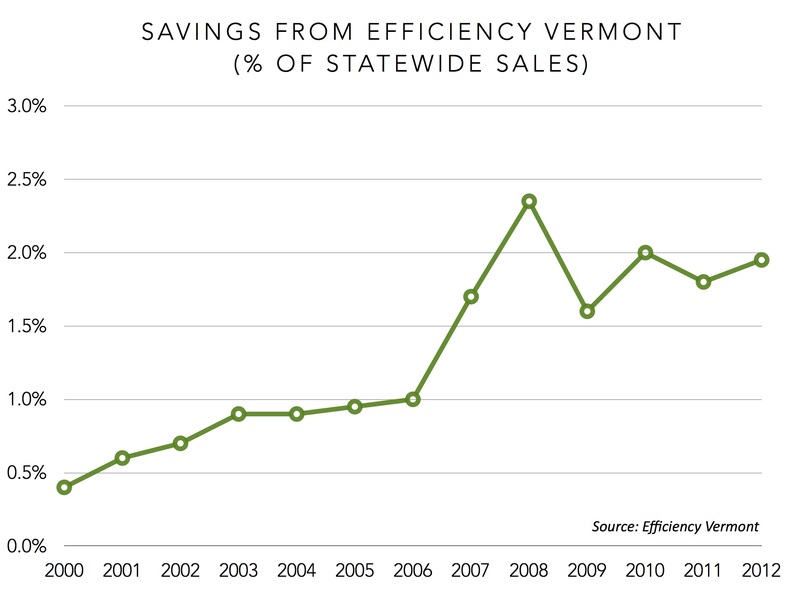 Vermont instituted partial decoupling policy for its two largest investor-owned utilities in the mid-2000s.104 As in many other states, it has helped insulate these utilities from the substantial energy savings produced from energy efficiency programs. Vermont has a mix of utility 2.0 policies, particularly decoupling, integration of distribution and transmission planning, and the separate oversight of energy efficiency programs. It also has two key energy democracy policies – net metering and a feed-in tariff – that are among the most ambitious in the country (as a percentage of potential load and peak demand served). In contrast, its renewable energy requirement is remarkably weak in contrast with other states, showing a greater dependence on distributed generation to achieve renewable energy growth. 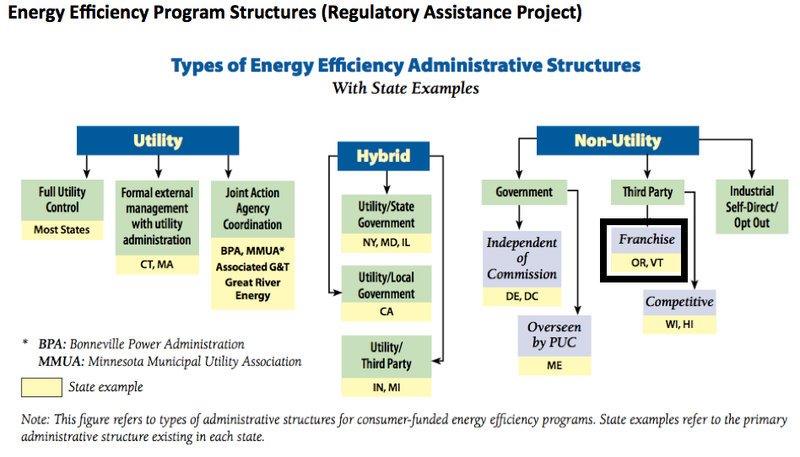 Vermont may have traveled farther along the path toward utility 2.0 than most states (excepting Hawaii or California, perhaps), but the regulatory model falls short on some key structural changes. The distribution system remains firmly in control of incumbent utilities, far from the independent distribution operator envisioned by New York’s Reforming the Energy Vision and others. On the other hand, the state is achieving many of the principles of the 2.0 electric utility system. Its energy efficiency achievements rank among the best in the country. Close to 15% of its electricity comes from renewable energy in 2013, putting it among state leaders. It even has elements of energy democracy because the combination of the net metering and feed-in tariff programs mean as much as 25% of the state’s peak energy demand will be met by distributed generation, far more than most other states. Vermont is definitely a state to watch. This article originally posted at ilsr.org. For timely updates, follow John Farrell onTwitter or get the Democratic Energy weekly update. 63. 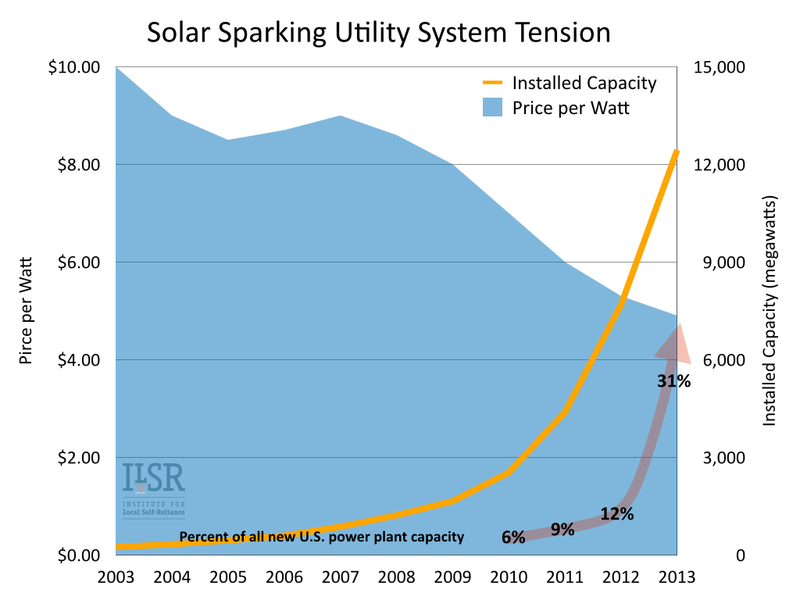 Solar Market Insight Report 2013 Year in Review. (Solar Energy Industries Association, 2013). Accessed 12/8/14 at http://bit.ly/1zGO3zQ. 64. Shahan, Zachary. What Does A SolarCity/Tesla Storage System Cost? (CleanTechnica, 11/3/14). Accessed 12/4/14 at http://bit.ly/12CcZOj. 65. Lacey, Stephen. Resiliency: How Superstorm Sandy Changed America’s Grid. (GreenTech Media, 2014). Accessed 12/4/14 at http://bit.ly/1w3Hj14. 66. LaMonica, Martin. Microgrids Keep Power Flowing Through Sandy Outages. (MIT Technology Review, 11/7/12). Accessed 12/4/14 at http://bit.ly/1w3Hols. 67. Kind, Peter. Disruptive Challenges: Financial Implications and Strategic Responses to a Changing Retail Electric Business. (Energy Infrastructure Advocates on behalf of Edison Electric Institute, January 2013). Accessed 11/7/14 at http://bit.ly/1yguey7. 68. Passera, Laurel. Integrated Distribution Planning: a path to sustaining growth. (Interstate Renewable Energy Council, Inc, 6/12/13). Accessed 10/29/14 at http://bit.ly/1wEpPFo. 69. Reforming the Energy Vision. (NYS Department of Public Service, Staff Report, 4/24/14), p12. Accessed 10/20/14 at http://cl.ly/0C0V0T2j2u30. 70. Aggarwal, Sonia, et al. Trending Topics in Electricity Today: the Distribution System Operator. (American’s Power Plan, 9/23/14). Accessed 10/29/14 at http://bit.ly/1wEoPRM. 71. Sedano, Richard. Who Should Deliver Ratepayer-Funded Energy Efficiency? A 2011 Update. (Regulatory Assistance Project, November 2011). Accessed 11/3/14 at http://1.usa.gov/1ph2aeB. 72. Reforming the Energy Vision. (NYS Department of Public Service, Staff Report, 4/24/14). Accessed 10/20/14 at http://cl.ly/0C0V0T2j2u30. 73. Reforming the Energy Vision. (NYS Department of Public Service, Staff Report, 4/24/14). Accessed 10/20/14 at http://cl.ly/0C0V0T2j2u30. 74. Reforming the Energy Vision. (NYS Department of Public Service, Staff Report, 4/24/14), p49-50. Accessed 10/20/14 at http://cl.ly/0C0V0T2j2u30. 75. Reforming the Energy Vision. (NYS Department of Public Service, Staff Report, 4/24/14), p50. Accessed 10/20/14 at http://cl.ly/0C0V0T2j2u30. 76. Installation data from the Solar Energy Industry Association and American Wind Energy Association. 77 Gilleo, Annie, et al. The 2014 State Energy Efficiency Scorecard. (American Council for an Energy-Efficient Economy, October 2014). Accessed 12/10/14 at http://bit.ly/1whrHnQ. 78. About NY-Sun. (State of New York, 2014). Accessed 12/10/14 at http://ny-sun.ny.gov/About/About-NY-Sun. 79. Lindl, Tim and Kevin Fox, et al. Integrated Distribution Planning Concept Paper. (Interstate Renewable Energy Council, Inc., May 2013). Accessed 10/29/14 at http://1.usa.gov/1wErKtI. 80. Lindl, Tim and Kevin Fox, et al. Integrated Distribution Planning Concept Paper. (Interstate Renewable Energy Council, Inc., May 2013). Accessed 10/29/14 at http://1.usa.gov/1wErKtI. 81. Vorrath, Sophie. Hawaii utilites capitulate on solar, in 65% renewables plan. (Renew Economy, 8/28/14). Accessed 11/5/14 at http://bit.ly/1EirVOT. 82. Paulos, Bentham. Hawaii passes point of no return on distributed generation. (Renew Economy, 5/23/14). Accessed 11/3/14 at http://bit.ly/1zsFlb0. 83. Vorrath, Sophie. Hawaii utilities capitulate on solar, in 65% renewables plan. (Renew Economy, 8/28/14). Accessed 11/5/14 at http://bit.ly/1EirVOT. 84. Maine revised statutes, Chapter 3143. Accessed 11/5/14 at http://bit.ly/1EiurVf. 85. 2012 Annual Report. (Maine Public Utilities Commission, 2/1/13). Accessed 11/5/14 at http://1.usa.gov/ 1EiuLTY. 86. Hinchman, Steve. Gridsolar Proposes Electric Rates to Encourage Solar, Efficiency. (The Portland Sun, 4/7/14). Accessed 11/5/14 at http://bit.ly/1Eiv1lV. 87. Turkel, Tux. CMP’s new rate plan would add $3 to bills. (Portland Press Herald, 7/7/14). Accessed 11/5/14 at http://bit.ly/1tIfk4y; Fishell, Darren. CMP and solar energy advocates clash over what’s the smartest grid for Maine. (Bangor Daily News, 4/18/14). Accessed 11/5/14 at http://bit.ly/1EiwIQg. 88. Ruys, Jurriaan, et al. Consumers at the Gate. (Rocky Mountain Institute, 9/10/14). Accessed 11/5/14 at http://bit.ly/10vCO10. 89. Sedano, Richard. Who Should Deliver Ratepayer-Funded Energy Efficiency? A 2011 Update. (Regulatory Assistance Project, November 2011). Accessed 11/3/14 at http://1.usa.gov/1ph2aeB. 90. Annual Report, 2012. (Efficiency Vermont, October 2013). Accessed 9/3/14 at http://bit.ly/1un06QP. 91. Annual Report, 2012. (Efficiency Vermont, October 2013). Accessed 9/3/14 at http://bit.ly/1un06QP. 93. About the VSPC. (Vermont System Planning Committee). Accessed 9/3/14 at http://bit.ly/1Cqoo13. 94. About the VSPC. (Vermont System Planning Committee). Accessed 9/3/14 at http://bit.ly/1Cqoo13. 96. Wikipedia contributors. Energy in Vermont. (Wikipedia, The Free Encyclopedia, 10/6/14). Accessed 11/5/14 at http://bit.ly/1uvMczh. 97. Email communication with Ben Walsh of VPIRG, 9/4/14. 98. Email communication with Ben Walsh of VPIRG, 9/4/14. 99. Valenza, Tor “Solar Fred.” Why a Vermont Utility CEO Is Embracing Solar and Net Metering. (Renewable Energy World, 5/6/14). 100. Baird, Joel Banner. Solar Electric Power Association names Vermont’s Green Mountain Power ‘Utility of the Year’. (Burlington Free Press, 10/22/13). Accessed 11/5/14 at http://bit.ly/1krCRnt. 101. Flagg, Kathryn. Too Much of a Good Thing? Inside Vermont’s Solar Standoff. (Seven Days, 10/9/13)Accessed 8/8/14 at http://bit.ly/1krDgGu. 102. Stebbins, Gabrielle. Vermont’s Swift Passage of Net-Metering Expansion. (Green Energy Times, 4/15/2014). Accessed 8/8/14 at http://bit.ly/1krDKfE. 103. Net Metering. (Public Service Department, 2014). Accessed 11/5/14 at http://bit.ly/10vApmU.